EXCLUSIVE: Senior EU figures have privately rubbished Labour’s Brexit policy. The shadow Brexit team is committed to retaining all of the benefits of the single market while negotiating a deal on the free movement of people. However, a senior official in the European Commission told Business Insider that Labour’s plan to leave the single market but retain all its benefits is “cakeism” and would be rejected in negotiations. “If you want it in a nutshell, the single market isn’t divisible,” the source said. A group of Labour MPs have urged leader Jeremy Corbyn to back an amendment to the Brexit bill which seeks to keep Britain in the EEA, where member countries adhere to free movement. 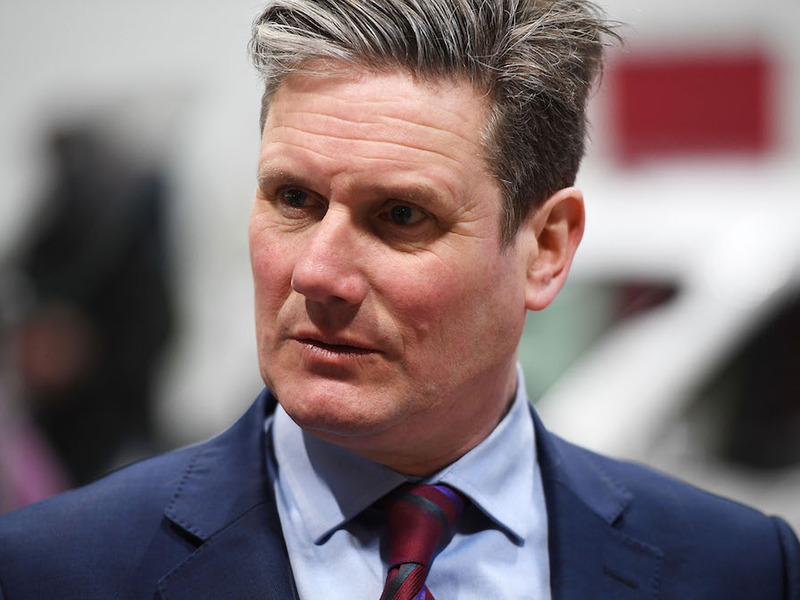 Allies of Labour’s Brexit spokesperson, Sir Keir Starmer, reject suggestions that the free movement of people is non-negotiable. LONDON – Senior European Union figures have rubbished the Labour Party’s Brexit policy of maintaining all the benefits of the single market, while restricting the free movement of people, as unworkable “cakeism” that would not be accepted by the EU. Labour is committed to negotiating a new single market deal with greater flexibility on free movement than that enjoyed by countries such as Norway. However senior EU officials have rejected this, telling Business Insider that the four freedoms associated with single market membership are indivisible. “We are confident we can build a new relationship with the EU. We want the UK to have a better deal than the Norway model,” the Labour leader to the House of Commons last week. The party has rejected an amendment to the Brexit bill, set to be voted on by MPs today, which would seek to keep Britain in the EEA. Labour’s Brexit team believes its willingness to accept all EU regulations and standards would persuade Brussels to be flexible on issues such as free movement. “In France and Germany, they are talking about the free movement of people. Standards are much more important to the EU than immigration,” an ally of Shadow Brexit Secretary, Sir Keir Starmer, told BI last month. However, a senior European Commission official involved in Brexit negotiations told BI that while Labour’s policy has a better “starting point” than the UK government’s, its goals amount to cherry-picking and would be rejected. Leon Neal/Getty ImagesSir Keir Starmer. “The starting point is not a bad one in that amendment. It’s one of alignment rather than divergence. It also proposes some form of customs union. That’s much better. That’s all good,” the Commission official said. Although Labour’s Brexit policy hasn’t been the subject of formal discussions in the Commission, senior EU figures have been privately discussing it since the shadow frontbench amendment was put down. “The only positions which are discussed in a formal sense are the ones of the UK government and the European Union expressed through [Michel] Barnier. But obviously, people here have been talking about this,” they said. Labour are as bad as the Tories, selling a unicorn to paste over their internal decisions. A Labour MEP in Brussels offered their own criticism of the policy. “It reinforces the mad ‘cake and eat it’ approach that is the figment of imagination that exists only in Westminster and not elsewhere in the EU,” they said. A source close to Starmer told BI that the single market amendment was designed to “set out the principles of what we want a future single market deal to look like” and to act as a “starting point” in the debate on Britain’s future relationship with the single market. “We believe it opens the door for a far more constructive negotiation because, unlike the Government, we’re accepting the need for shared institutions, common regulatory standards, no new impediments to trade,” they added. The European Commission is yet to respond to our request for comment. MPs will on Wednesday vote on an amendment to the Brexit bill that could keep force Theresa May to change course and stay in the European Economic Area. The Labour leadership are set to abstain on the vote. However, news that senior EU figures view Labour’s single market policy as unworkable will likely fuel calls from pro-EU Labour MPs for their colleagues to rebel against Corbyn and vote for the EEA amendment later today. Former Shadow Cabinet ministers Owen Smith and Chuka Umunna, plus MPs including Stephen Kinnock, Alison McGovern and Wes Streeting, have all called on Corbyn to embrace the Norway option. Kinnock argued that the Norway model takes Labour closer to restricting the inward migration of EEA citizens than the frontbench amendment, as the EEA Agreement provides a possible mechanism for suspending the four freedoms. “The frontbench amendment makes no mention of free movement, and indeed states that there should be ‘no new impediments to trade,’ whereas the EEA provides a solid, treaty-based mechanism for the suspension and reform of FoM,” he told BI this week. There is a range of opinion on whether Britain would realistically be able to use this mechanism. At least 60 Labour MPs are preparing to join other opposition MPs and a handful of Conservative rebels by voting for the EEA amendment today, BI has been told. However, this would not be enough to inflict a defeat on the government. A spokesperson for anti-hard Brexit group Open Britain urged more Labour MPs to back the amendment. Labour’s sister party in Northern Ireland, the SDLP, has today written to Labour MPs in Westminster, urging them to vote for the EEA amendment for the sake of maintaining the invisible border on the island of Ireland. “While membership of the EEA is not the SDLP’s ideal position, the adoption of this amendment will allow for the necessary alignment with the single market which is fundamental to preventing a hard border on the island of Ireland,” the SLDP’s leader Colum Eastwood said in an email to Labour MPs.